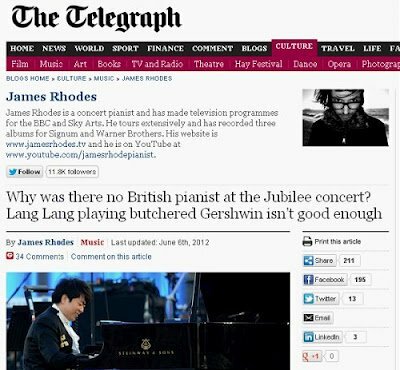 In the Telegraph article above James Rhodes asks "Why was there no British pianist at the Jubilee concert?" Well, the answer is quite simple. American Keith Lockhart, who conducted the Jubilee concert, is managed by Columbia Artists Management Inc, who also manage Jubilee pianist Lang Lang and handle US representation of the band that played at the royal bash, the BBC Concert Orchestra. And staying on this path, Columbia Artists Management featured here recently in a blast from the past.